A review of Boston Mutual Health Insurance Company leads to Boston Mutual Life Insurance Company. 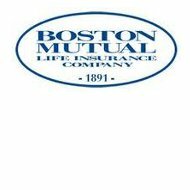 Founded in 1891, Boston Mutual specializes in life insurance and disability insurance. They do sell health insurance, auto insurance, or other types of personal or corporate insurance. They sell individual products, group products, and voluntary worksite products. Boston Mutual’s individual life insurance is for the direct purchase of a life insurance policy by an individual. This means that it is not through an employer. Ordinary life insurance policies offered by Boston Mutual have level premiums and are available for anyone ages 0-80. All policies are available with the option of annual dividend payouts. Boston Mutual also offers disability income insurance to individuals. This can be for accident or accident and sickness both depending on how the plan is set up. This policy is guaranteed to renew from the time of purchase up until the age of 65. Once the policy is purchased, it cannot be cancelled until the annual renewal or cancellation date. Policies can be purchased for 30, 60, 90, or 180 day income periods. Simplified Disability Income Insurance is a disability insurance policy developed specifically for federal and postal markets. This policy can also be for accident only or sickness and accident combine. There is a variety of benefits associated with this policy that individuals can choose in order to customize the plan to meet their needs. Boston Mutual’s Legacy Life Select Insurance is for state, federal and postal employees. This policy allows for individuals to receive an endowment up to the age of 98, and a policy can be purchased for anyone ages 0-80. Premiums level out as each yearly renewal comes up. Boston Mutual also offers Whole Life Insurance, a variety of riders to attach to policies, extra coverage policies, policies specifically designed for children, accidental death benefit coverage, spouse insurance coverage, transfer options, waiver of premiums during claim periods, and accelerated benefit options. The life and accidental death and dismemberment insurance plan offered by Boston Mutual is for employers to offer to their employees. This program has a variety of limit options such as length of service, salary bases, occupational based, or flat dollar amount. Coverage options are also available for spouses and children of employee as well. Within this policy is also an accelerated death benefit. This is a fairly new idea within the life insurance industry. It allows individuals who have been diagnosed with a terminal illness and who have been given less than twelve months to live to withdraw a percentage of their life insurance money immediately. This is so they can do something they have always wanted to do or travel before their death. This policy also allows the holder to keep the policy, if their employment ends. It is called a Portable Policy. Additional offerings from Boston Mutual are part time coverage, retiree coverage, single premium options, layoff premiums, leave of absence premiums, and multiple year rate guarantees. Voluntary worksite products are life insurance and disability insurance products that an employer can offer but the employee pays the whole amount. The premium amount is still cheaper than an individual purchasing a policy on their own would receive because a group rate is available. In this category, Interest Sensitive Life Insurance is offered. This traditional life insurance policy covers the employee, the employee’s spouse, children, and grandchildren. It is also a portable policy and once a premium is set, it is guaranteed not to change. This policy has a smoker and non-smoker rate and a variety of riders that can be added. The voluntary short term and long-term disability options are available for accidents and sickness. Each of these comes with a mental illness benefit, an alcohol benefit, a drug benefit, and a waiver of premiums during the duration that the disability insurance is paid out. Boston Mutual also offers accident insurance on a voluntary basis. This covers the cost of hospitalizations, emergency room visits, transportation to the hospital, follow-up care, dislocations, fractures, lacerations, and burns. It is a portable policy that can be extended to a spouse and children. Where can I find my policy online?